A catalog of my personal adventures in computing. I have been working on a rollout of Lync 2013 at my company over the last couple weeks. We are moving from an OpenFire/Spark setup to Lync mostly because we wanted to give our users the ability to do video chats and screen share's easily and Spark did not really provide this functionality for us. 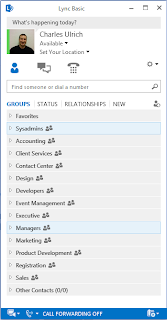 The biggest thing we found lacking in Lync 2013 is no central management of Contact Groups. With Spark we setup the groups and they are loaded whenever a user signs on. Our users really like having this list and we did not want them to have to manually configure all of the groups. I was not able to find any specifics of exactly how to do this on the web so I decided to roll up my sleeves and do it myself. There are a few more things I would like to add to it and clean up but I wanted to get it out in the wild for other people to use. Currently this script will only update the Contact Groups for a user who has logged into the server at least once. Additionally if the user has already added some of the groups in the past it will retain the original order of the previously added groups and append the new ones on at the bottom. You will need 7-Zip installed on your link server to run this script. Create a reference account and add the Contact Groups you want to load for your other users. Log into your Lync Server and from the Lync Management Shell export the user you updated with the following command. Export-CsUserData -PoolFqdn "YOURLINKPOOL" -UserFilter first.last@something.com -FileName "c:\temp\ExportedUserData.zip"
Extract the Zip file and open the DocItemSet.xml file. I recommend using Notepad++ with the XML Tools Plug to format that file into something readable. #    Description:    Script to update the Contact List for 1 or All Lync 2013 users. #                    2. 7-Zip must be installed - Used to manage the ZIP files from the export and needed for the import. #                    3. If not running under Powershell v3.0 see comments in MultipleSelectionBox function. # This version has been updated to work with Powershell v3.0. # This specifies the scope of the X variable. Not sure why this is needed for v3. $user_email=MultipleSelectionBox $userlist.UserPrincipalName "Choose Lync 2013 User" "One"
$sure = Read-Host "About to upload the changes to the server. Are you sure? (Y or N)"
Write-Host "Please Come Again! :) "
hi, nice work, I can manage&copy contact groups for all my lync users. In addition, can we copy contact groups and its members? I am not positive but I am willing to bet the script could be tweaked a bit to handle that. In order to make the contact list dynamic I tied them to AD Groups so that as we add new people they get added to the list automatically. If you built out specific groups and changes would have to pushed out to everyone via a new script run. thanks, great tool, but it would be really intresting to know how to export not only groups, but also its members. any ideas? The nice part about doing it this way is that the groups are all controlled by Active Directory membership. This way you don't have to repopulate this list over and over again. But, if you want to manually create groups then add users to them the next section of the XML file would be of interest. It follows directly after the ContactGroups Node and is named Contacts. I would encourage you to do the XML export command for a user that you pre-configure and take a look. Hello Charles. Nice work. I see a nice effect with users have UPN unequal the SIP Address, they user UPN not SIP Domain suffix shown in the selection window. Have you an Idea how I could add the SIP Domain Suffix instead the UPN Suffix? Based on this output you can tell the SIP address is stored in "SipAddress". $user_email=MultipleSelectionBox $userlist.SipAddress "Choose Lync 2013 User" "One"
$user_email=MultipleSelectionBox $userlist.WindowsEmailAddress "Choose Lync 2013 User" "One"
I am not sure how you tied the Groups to AD. I can't find it anywhere in the code. Lync does this automatically. When you are in the contact list search for an AD distribution group. Right click it and choose "Add to Contacts List". 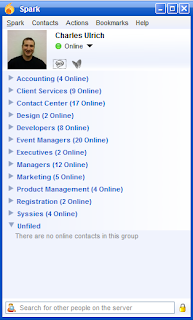 This will add the AD Group as a Lync Contact group and it will stay updated based on the membership of that group. OK, that explains it. We still don’t run Exchange, so we have some problems with all connections. I made some changes to your script to be able to add groups to new contacts. I tried this modification to allow it to work for new users (never logged in), but it puts out bad XML. Does this not work if the user has logged in before? Any idea how to add contacts to a brand new user? When I pull down the XML it's completely blank. You can use my changes above to enable Contacts for new users. First off thank you for posting this script it is realy a great help! i'm now trying to get the script so it updates a users contact list rather than replace it on each run but seem to be having a mare getting the XML apend function to work and was wondering if somone could point me in the right direction? ## I think the issue is that it is trying to apend the new "ContactGroup" data into the "ContactGroups" Node rather than making a new "ContactGroup" node under "ContactGroups". Sorry for the late reply. I have been in the middle of a crazy summer. I had a ton of trouble getting the XML to work the way I wanted it to as well. Where you able to figure it out? Thanks for the script, this is great. One question though, you have either two options here: update one user, or update all users. Is the potential to selectively choose (some) users here? Sure. You would have to add another option. I would probably try to use a multiple selection box instead to to pick the users. Then in the case of some and not all users loop through the selected users exporting, updating, then importing them each 1 by 1. I am having a weird issue that I do not seem to be able to find a solution for or in fact find anyone having the same problem. When I run the Export-CSUserData after adding my Distribution Groups to my test.user@domain.com I do not have the node in the XML file??? I have created several other test users, restarted the server, ran update-csaddressbook, ran update-csuserdatabase, gave it ample time to replicate and sync, no errors in the event log about anything and still no . Does anyone know why this would occur and how I can fix this? Thank you. Unfortunately you cannot pre populate users. Thank you for your reply. 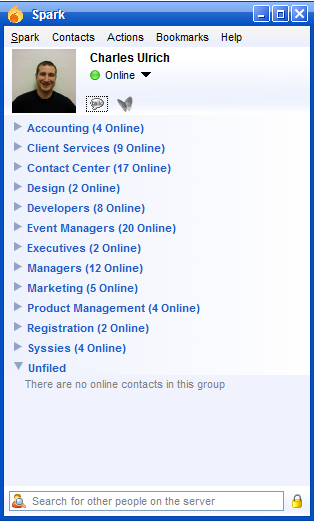 I have logged into lync with the test.user, that is how i added the distribution groups to the contact list. This test.user was going to be my "source" user that i was going to use for adding and organizing the distribution groups for the organization. Even in the OWA for the test.user i can see the groups added to the "Lync Contacts" section under settings. Then when i run the Export command no contactgroups node can be found in the xml i do not even see the contact node for the groups i just created manually for that user as mentioned above in a previous post by Charles UlrichApril 17, 2013 at 12:20 PM. I am not sure. I did not do anything special to make it show the Group Name. My first guess would be there is some problem with the communication between Lync and AD. Do you have Exchange in your infrastructure? How DG were created? With which tool? Yes...Exchange 2010, AD and Forest at 2010 functional level. They are all mail enabled security groups so they were most likely created via Exchange Console. It is working fine. But if UCS (unified contact store) is enabled for a user, it doesn’t export the groups to that user. As a solution, I disabled the UCS from all users. I suspect there is probably something wrong with your import file. It is failing on the Update-CSUserData command. I would try running just that line manually. Is it possible to modify this script to Update all of the groups with the according users from the Exported file? And has anyone tried to do this? Great Script for the Groups but I'm looking for the same thing as Reinis due to Lync 2011 for Mac not able to support AD Groups. any suggested on how I loop adding users into a script? Hello Charles, would you have another script that can import a master contact list with user groups and all its members? Great script Charles. And also thanks to raderarn for fix to add mannual groups with users. But here is the question how to delete user from list? I adapted the original script to work with Contacts instead of groups. Write-Host "Error - No Contact Elements exist in this DocItem Node"
Exception calling "ReplaceChild" with "2" argument(s): "Object reference not set to an instance of an object." I´m geeting the same error as informed by Sully. But it happens only to a few users, others are running perfectly. The DocItem Elements were stripped out when I posted resulting in a blank entry. Basically, you populate with Contacts -- everything between and with each contact on a single line followed by and a CR/LF. This code will update the Groups AND the Contacts for all users....WITHOUT the use of 7zip. I removed the single user option for this as I wanted to make all contact groups for the company the same but i'm sure you can rewrite to your needs. Download the zip from here and Read the ReadMe file. There is a note that this must be run on the Lync server. Has anyone tried with Lync Online as part of Office 365? Have you found an online version solution? exactly what i needed, thanks for sharing. I had to adapt the script for my environment, but it worked perfectly. One thing that a realized, if the user if recent created and the account was never logged on it, the script does not work. The reason of that is because when you export the csdata the file does not contain the node and the script cannot replace a node that it didn´t find. "Due to DCOM-error connection to server %Here_comes_my_server(pool)_fqdn% can't be established. Check if Front-End-Service for this pool is running"
Of course, the service is running and pool is functional. I ran the command to update all users.. but i seem to be getting an error for some on Update-CSUserData: Out of objects in the pool, the quota was reached.. any ideas why that might be? Also.. some minutes later.. often the same user that failed will then work.. very strange.. and in addition.. the update option i thought didnt erase custom groups people have made, but it does. Hi Charlie, I'm trying to use your script to import the contacts in Skype for Business, but I imported only a group of contacts. They are empty. How do I imortirovat also contact these groups? Anton, Sorry but I am not sure that this will work at all in Skype for Business. I have not used this code myself since late 2013. However please post back here if you figure it out as this page still sees lots of traffic. I have just tried this with SfB and still works a treat!... Just make sure you run it in Windows Powershell and not the SfB Powershell. I have discovered, that if you are running into errors (HRESULT), etc... If you manually delete the current contacts/groups from the users list, and attempt to run this script, it works flawlessly. The other alternative, is to disable/re-enable the user from the SfB Management Shell. The only crappy thing about that, is that you will then need to login the user at least once, to update their list. I have tested, and this is working with SfB 2015. Wonderful script, my friend!